Review copy provided via Saima Agency, thank you! Illuminations chronicles the life of Hildegard von Bingen (1098–1179), who was tithed to the church at the age of eight and expected to live out her days in silent submission as the handmaiden of a renowned but disturbed young nun, Jutta von Sponheim. Instead, Hildegard rejected Jutta’s masochistic piety and found comfort and grace in studying books, growing herbs, and rejoicing in her own secret visions of the divine. When Jutta died some three decades later, Hildegard broke out of her prison with the heavenly calling to speak and write about her visions and to liberate her sisters and herself from the soul-destroying anchorage. Like Anita Diamant’s portrayal of Dinah in The Red Tent, Mary Sharratt interweaves historical research with psychological insight and vivid imagination to write an engaging and triumphant portrait of a courageous and remarkably resilient woman and the life she might have lived. Deeply affecting, Illuminations is a testament to the power of faith, love, and self-creation. Anchorite: a person who lives in seclusion, esp a religious recluse; hermit. Author Mary Sharratt brings us a story of Saint Hildegard beginning when she was given to the church at an early age as a tithe, accompanying a wealthy young woman. I cannot imagine the sacrifice of being an anchorite, and being walled in with little sustenance for a young girl around nine years old. Somehow housed within this prison of sorts, Hildegard finds her own peace with the lot of her life and embraces any sort of past time that comes her way, from books to herbs to embroidery. Her beautiful companion, Jutta, is portrayed as perhaps a bit mad as she is eager to be cloistered away from the evil hands of her brother. Hildegard is portrayed as being made of stronger stuff than Jutta, and ably survives being shut within walls for what seems to be eternity, as Jutta is happy to be viewed as pious and full of grace as she starves herself. Meanwhile, ever since Hildegard can remember, Hildegard is the one who is seemingly touched by God as she sees prophetic visions that are difficult for anyone to understand. She is immediately rebuked as being mad and learns to hides her visions as many view these visions to come from the devil. It is not until later that she is able to use them to help guide others, although she always had many detractors. Once she is out of the stifling grip of Jutta, whom everyone loved more than she, Hildegard was able to exert herself over those in the monastery who oversaw her care. She began to speak out against the severe treatment of girls brought to the anchorage and to discourage very young girls from being forced into the anchorage at such an early age. Although the book seems to be a short one, there was a lot packed into it. 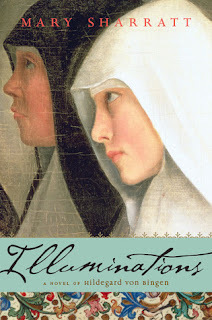 The novel brings to light all of the struggles that Hildegard faced beginning from her enclosure all the way into her last days as an abbess, and it speaks to the enormous sacrifice that nuns and those of religious vocation make. It also hints at the debauchery that hides behind the walls once Bernard of Clairvaux dies and how the times changed as money instead of God becomes the driving force behind the monasteries and abbeys. I really enjoyed this story and the telling of Hildegard's difficult life; it is not sugar coated with her piety but shows Hildegard as a true woman with real desires and needs. Her intellect seems to have known no bounds, as she is remembered for her music, poetry and scientific writings. The people of her life were also intriguing characters, especially the beautiful Jutta and Richardis, and Volmar, the one monk who was never failing in his support of Hildegard. What an honor to have read this dramatic story of a woman who is well deserving of her recent recognition as a Doctor of the Church which comes much too late.